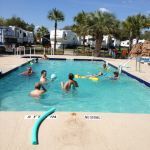 Ask fellow campers about "Ocala Sun RV Resort" and nearby attractions. We were told they had blazing fast high-speed internet access. When we arrived their WI-FI was not working and they had to reset it. It then was so slow and constantly disconnecting and needing to be reset it was unusable! When I complained about it they offered to set us up with a modem and connection through Bright House Networks, and I said sure. When the technician showed up 3 days later to install the modem he expected me to pay for everything. The park had set up the service with Bright House in my name! Totally unacceptable! When I complained about that they told us to leave! The sites are in an open field and there aren't many trees around. There not very level either and required me to use several blocks just to get close to being level! They claim to have an exercise room and they did not! The pool and spa are heated but the spa is attached to the pool so it's the same temperature as the pool. It's not like a separate hot water spa. We camped at Ocala Sun RV Resort in a Motorhome. The owners of this park could not be more accommodating. The staff starting with the check-in personal could not have been nicer. The staff person whom escorted us to our site (also asked if we needed help hooking up) was so personable, the maintained staff is very efficient. The showers, bathrooms, laundry rooms, club house could not have been cleaner. The staff comes around every morning to your site and picks up your garbage. They have wonderful activities, if you choose to participate, and the Activities Director is so accommodating and fun. We can not say enough about this park, it was truly a wonderful experience, one of the nicest parks we have stayed at. We camped at Ocala Sun RV Resort in a Motorhome. Rate reflects a monthly rate. We've stayed here before, but what a difference the new owners/managers have made! Many sites with concrete or paver patios, landscaping, clean heated pool, strong and free wi-fi, great clubhouse, trash pickup at site. Many activities including Saturday morning coffee and donuts, water aerobics, etc. Staff is ultra friendly and helpful. We camped at Ocala Sun RV Resort in a Motorhome. Very friendy staff and a nice place. Has a nice pool. Easy access to I-75. The park is a big open grassy lot with no pads that seems typical to Florida. We camped at Ocala Sun RV Resort in a Fifth Wheel. Ah, now this is my idea of a really nice RV park. Wide, pull-through spaces that can accommodate even big rigs with no problem. 50 amp service at most sites, with some 30 amp available up by the office. Friendly staff, a fully equipped rec room with a pool table, indoor shuffle board, and ping-pong. The WiFi at this park is actually fast (they just had it fixed). Has a swimming pool, on-site laundry and propane. The showers and bathrooms are like your own private office with a door that locks instead of just a flimsy curtain. The site has new owners who have made major improvements. This is a great RV resort with a nice set-back from the busy road and located just far enough from I-75 that you can barely hear it. Plus the rates are really reasonable. The only con at this campground are that there are no sidewalks adjacent to the park, so if you want to walk, it's the same 1/2 mile circle over and over. An ice machine and vending machines for soda or a camp store would be a big improvement. We camped at Ocala Sun RV Resort in a Fifth Wheel. Good Park, basically an grass field with hookups. WiFi was not free - had to get Tangonet for $15 per week. Check-in was efficient, easy access from interstate. Great walking area around park and dog park with bathing area. Pool was heated and clean. 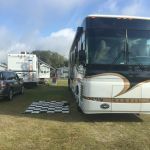 We camped at Ocala Sun RV Resort in a Motorhome. We used Passport America so our rate was lower. This is a park used by people for long term stays. Sites are grass but level. Dead grass all over the place and tracked into your RV in the mornings when wet with dew. We were not impressed by this park. We left after 3 days. Park has just been sold so changes in the future. We camped at Ocala Sun RV Resort in a Fifth Wheel. We stopped here on our way to Florida. The $19 was Passport America rate and was paid in cash (could use a check). The sites were all on grass and parking is alternated so there is some room between campers, but still very close. We were escorted to our site which was good as after dark might have been difficult to find. The site was fairly level. Tengo internet was available and connectivity was good. The dog walk area was great and fairly dog waste free. We would stay here again only if it was not raining. 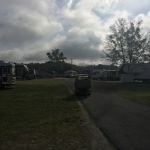 We camped at Ocala Sun RV Resort in a Motorhome. We stopped here after a long drive south, ended up staying 6 nights, more than planned so we could check out the area. Staff very pleasant and helpful, everything very clean and well kept. Biggest complaints were no picnic table at site, no trees and when they are busy you end up really packed in. They brought another motorhome to park next to us and we had to take down our awning so they could fit! Otherwise nice place and pet friendly. We would stop here again on our way south! We camped at Ocala Sun RV Resort in a Motorhome. I highly recommend this campground. Updated, clean, nice people, things to do, lots of conveniences. What more do you want. We came here from Ocala RV Camp Resort (see review) as did many people. This is what a campground should be like. Thank you Ocala Sun RV Resort! We camped at Ocala Sun RV Resort in a Fifth Wheel. A nice park: 55 and over park. It was quiet with friendly staff, nice showers and restrooms. Staff was very friendly. We camped at Ocala Sun RV Resort in a Motorhome. They had incomplete grounds. The staff was okay. I loved the facilities. I hated the rallies. There is lots of dog waste everywhere. There are some nice people. Someone stole our awning pole. Staff couldn't care less. We stayed for one week. We camped at Ocala Sun RV Resort in a Motorhome. We just love this place. It is for 55+ and the staff is just fantastic. Seems they cannot do enough for you to make you stay an enjoyable one. They do allow children for two weeks or so, so it is not as restrictive as some parks are. They are in process of rebuilding the park. Within the next thirty to forty days they should be completed putting in the cable, phone and Wi-Fi at every site. They are also adding 100 more sites. We camped at Ocala Sun RV Resort in a Motorhome. nice enough place. 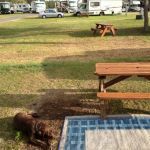 We camped at Ocala Sun RV Resort in a Truck Camper. Nice grassy new park far enough away from I-75 to miss the noise and near enough to be handy. Very nice front desk people invited us to their New Years Eve party when we checked in. We enjoyed our short one night visit and would certainly stay here again. We camped at Ocala Sun RV Resort in a Motorhome. Close to many fast food places, gas and Cracker Barrell. A grocery is close but would need directions. So ask at the office if you need one. This park is actually south of Ocala in the area of Marion Oaks FL. Ocala has great shopping and restaurants. Dan Garlits museum close by, Market of Marion (great flea and farmers market) on 441, The Villages have great restaurants and shopping. Also went to Daytona Beach and Disney. Lots to see and do all within a hours drive from the park. We enjoyed lunch at Swampy's in Dunnellon and always have great food at Harry's in Ocala. We saw a black snake in our neighbor's site, which was not poisonous, but gave us a startle. China house restaurant nearby was not much for ambiance (we took it to go) but was yummy. I recommend the vegetable lo mein. Drive West about 4 miles to Rt 200 for WalMart, Five Guys, Chili's, Ocala Medical Center. The Museum of Drag Racing is excellent and worth a visit if you are into motor sports of any kind. Very interesting. "Reds" restaurant about 5 miles south on Rt 200 past the Withlacootchee River was excellent and highly recommended for good old fashioned American cooking. Grocery store and good restaurants near by. We ate BBQ and it was some of the best I have ever had. Rainbow Springs, Silver Springs, Big Daddy Don Garlits museum. Plenty of restaurants, publix and winn dixie, gas stations, places to go and things to do! Minutes from I-75. RV friendly gas station at same exit. Go to visit Don Garlit's Museum of Drag Racing. They also have antique cars there for those that aren't into drag racing vehicles. Allow yourself 4-5 to visit the facility as there is a LOT of stuff to see. Walmart a few miles down the road. If you haven't tried a Hungry Howie's Pizza, this is your chance. Yum! Near Don Garlits Museum, a nice visit if into old cars and drag racing. Close to all facilities to include Walmart - 6 miles TSC - 1 mile and 11 miles from Ocala for movies and other activities. Over 10 restaurants and Winn Dixie within 1 mile. Try Market of Marion - 6 miles for haircut or 1000 other Flea market items. We enjoyed the Don Garlits Museum of Drag Racing. Fantastic exhibit and would highly recommend to anyone that's interested in racing. Shopping and restaurants 15 to 20 mins from park. Plenty to see here. Spend a week and enjoy. Check out The Villages, a short drive from the park. Amazing! There are more golf carts here than any place in the world, also some good restaurants-pizza at Flippers was good and inexpensive. Are you affiliated with Ocala Sun RV Resort ?